This is very important, especially if you are planning on any self-tanning for the big day. Your wedding makeup artist has to be given enough time to properly test different hues and find the perfect sun-kissed look for you. If there is one mistake that almost all brides regret, that is going for a totally new makeup look for their wedding day. As you know, many different effects can be achieved through makeup, some of which may drastically transform your usual look. This is not advisable as you may end up not feeling like yourself on the big day, which is exactly the opposite of what would make you feel confident in your beauty. Putting makeup only on your face can lead to a very unpleasant difference in tone (and even structure) between your face, neck, and other exposed skin areas. Be careful with over applying, though, as it won’t look natural. When your test makeup session is scheduled, go online and save some bridal looks you’ve fallen in love with. Show these to your makeup artist, but listen to their suggestions and advice as well – after all, they are professionals with a lot of experience, so discuss with them and be open to new ideas. Have in mind that your light and pale wedding dress (in most cases) will need some color on your face to compensate all the whiteness. Our advice is to use more color for your lips and cheeks and not overuse it on the eyelids as too much color there may take away the focus from your eyes. 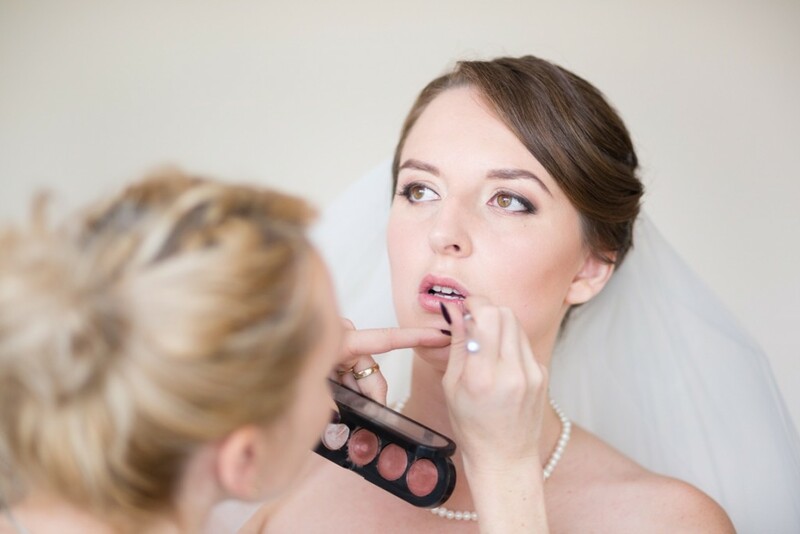 Many brides make the mistake of applying lipstick or lip gloss on their lips on their wedding day. There are so many reasons to choose lip stain over these two options! First, your lipstick (lip gloss) will get all over the groom during your kiss at the altar. Second, your lipstick (lip gloss) will inevitably make your veil stick to your lips, leaving unwanted marks here and there – both on your face and on your veil. Third, the shinier the lip product, the more unwanted glare it will give to your wedding photos. A lot of brides are mainly focused on tan, eye shadows, blush, etc. and forget about these two very important zones. Your eyebrows serve as a “frame” for your face while your eyelashes put the focus on your eyes. That’s why you should carefully prepare your brows before the makeup session (get them professionally waxed about a week before the big day) and choose the best eyelash enhancement method (individual eyelash extensions, waterproof mascara, etc).